The next in our regular installment of small brands doing interesting things looks at some ties, handkerchiefs and knitwear. 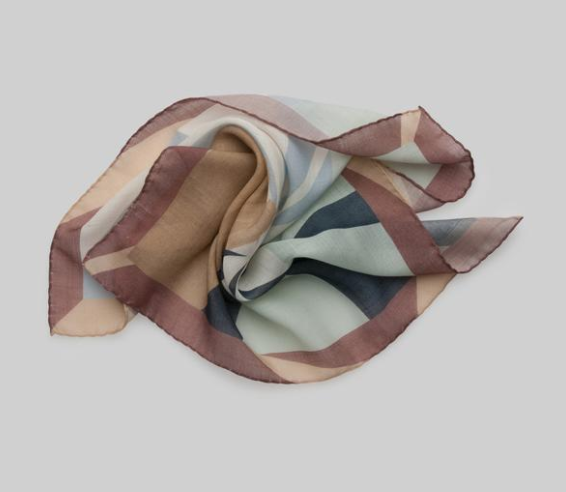 First up is a collaboration between Alexander Kraft and online accessories company Viola Milano. Kraft has designed a collection of nine 9-fold ties, unlined, in either cashmere or a small-knot silk grenadine. The extra folds and unlined nature of the ties emphasise the craft aspect of Viola Milano, while the latter is intended to make the product more about the material and less about the lining - bringing you closer to it. Whether this approach appeals will be largely personal and subjective. The lack of structure and multiple folds makes the cashmere in particular softer and free-flowing: the ties lose their clean lines, but replace them with a louche, casual look. While also subjective, I’m clearer on the width of the ties, which I would prefer to have been 9cm rather than 8cm. It might even have helped control that loucheness. The colour selection, on the other hand, is perfect, as you would might expect from Kraft’s classical leanings: charcoal, navy, pale grey, and my favourite, the natural. Kraft’s colours certainly come across as more sophisticated than new French tie brand Loic et Gil. So many people launch tie and handkerchief brands today, often because the minimums are small, manufacturing can be done fairly easily in Italy, and the lack of sizing makes both online sales and stock easier to handle. It’s rare that these new brands actually do something original that shows how traditional and stuck in their ways the established producers are. Loic et Gil say they launched out of a desire to do just this, but the vast majority of the designs look like simpler, cheaper versions of designs that Hermes, Charvet or luxury marques like Bulgari have been doing for a long time. They are well made but have little else to recommend them, particularly given the price (183 euros compared to Viola Milano’s 144). Someone that is producing genuinely different and strikingly modern accessories is Christian Kimber. Christian and I know each other from long ago days with Lodger, but given he is now in Australia (with a new shop - congrats there) I see him pretty rarely. It was only recently that I started wearing his handkerchiefs, therefore, although they’ve been around for a while. The hanks are all silk/wool blends, which is instantly less showy, less traditional and easier to wear that silks. I have several from Drake’s unicorn prints that I wear on rotation. But unlike Drake’s, Christian’s designs owe nothing to traditional squares. They are simple, abstract, and combine muted shades of grey, pink, blue and green, often separated by cream rather than white. Most importantly perhaps, they pay particular attention to the borders of the square, which often combine two useful colours, and are sometimes broken up. This makes them especially practical when arranged in the pocket. 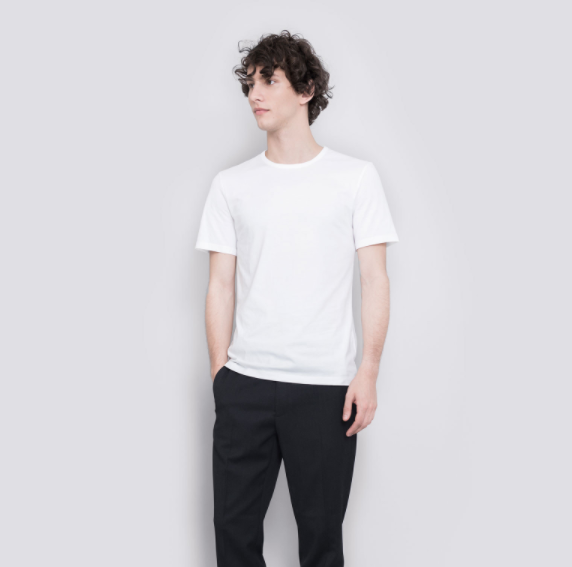 A Swedish brand, Asket offers casual basics such as T-shirts, knitwear and polos. Their pitch is about being transparent, delivering value, and producing essentials. Much of this is not that unusual. Any online-only brand can deliver better value to the customer than one with a store. Many today have dispensed with logos and traditional marketing. And most are happy to say and show where their things are made. But Asket are doing a couple of things which are different. The most striking one is offering three different ‘lengths’ alongside regular sizes. So there is a short, medium and long for every size from XS to XL. For someone like me, who is forever trying to decide whether he wants a T-shirt that is right for his height or right for his waist, but knows he cannot have both without searching dozens of different brands, this is very welcome. The other thing that stands out is Asket’s breakdown of its pricing, showing what it pays for raw materials, labour and shipping. Of course, this often raises more questions than it answers. It is also a little disingenuous in suggesting that designer brands simply multiply the same costs, rather than having extra costs they choose to carry. But I can see it going down well with customers keen on transparency. And most importantly, the quality is good. I tried the 30-euro T-shirt and the 195-euro cashmere sweater, and you’d be hard pressed to find the quality at this price anywhere else. You can follow the discussion on Brand round-up: Alexander Kraft, Loic et Gil, Christian Kimber, Asket by entering your email address in the box below. You will then receive an email every time a new comment is added. These will also contain a link to a page where you can stop the alerts, and remove all of your related data from the site. Hi Simon, I love seeing these articles and finding out about these smaller makers/designers/suppliers. It may be worth letting UK readers know that Christian Kimber pocket squares are available from Exquisite Trimmings who advertise on your site. I am not connected in any way with either CK or ET, but thought this may be useful to reduce any duty and/or shipping miles for customers living here. Cashmere ties – I love the look of them but really struggle how to pair them. Outside of tweeds what fabrics do they go well with? They are too informal for worsted business suits, wrong season for linen and I only tend to wear ties with suits rather than jacket/trousers meaning I have a small collection of great looking ties that I almost never use. I actually often wear them with worsted suits or more formal jackets, in order to balance some of the smartness of the tailoring. Not a look for everyone, but useful if you like wearing a suit but don’t want to appear too formal. And I’m sure we’d both agree, a lot better than wearing a suit with no tie at all. Hi Bob, I actually wear these cashmere ties (and designed them to be worn) both with formal business suits and sportier jacket/trousers combinations. These ties are made from super-fine cashmere, are completely unlined and of medium width which means they are much less bulky than “normal” wool or cashmere ties. 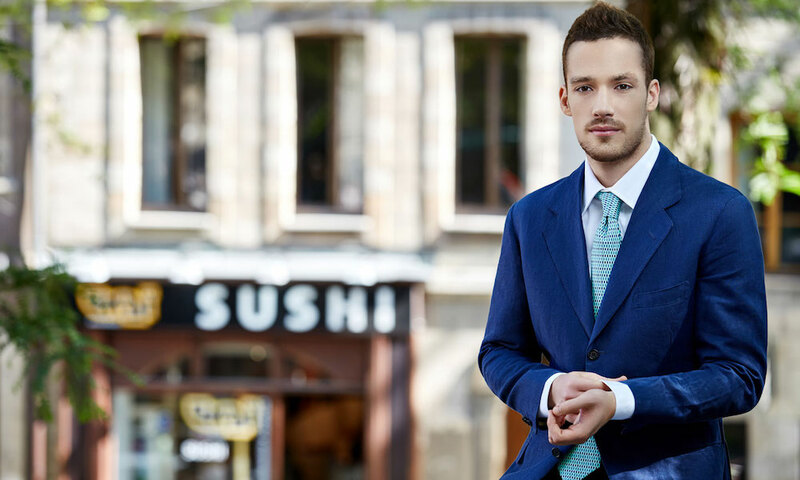 Due to their discreet, uniform colors, they go very well with “normal” business suits while lending an outfit at the same time a bit of “sprezzatura”; for example a grey or natural cashmere tie goes very well with a dark blue worsted suit. Of course, they also perfect for more casual combinations, for example with cream corduroy trousers and a blue blazer or a brown tweed/sport coat. Perhaps Viola Milano should take note of Asket’s pricing transparency? EUR 198 for that cashmere tie is utterly absurd. I agree. The mark up must be massive. Quite ridiculous in light of their business model. One can only conclude that there has been a significant bloom in the i-gentry ecosystem! On the other hand, I applaud Kimber’s creativity on the pocket squares. in fact, the price is far from ridiculous: Simon described the tie only briefly, but it is actually a 100% cashmere, 9-fold tie that is completely unlined and 100% handmade on Lake Como in Italy. 7-fold ties are the normal gold standard, but this here is (on my instigation) a 9-fold cashmere tie which means that are larger than usual cashmere square has to be used. The tie is also completely unlined which means that the sewing work needs to be much more accurate than usual as the slightest imperfections would be visible. Thus, not only are the costs for the high-end material higher than usual (due to the larger cashmere square), but also those for the production as this tie is much more labor intensive than a “normal” tie. Despite the marketing spiel, the mark-up is ridiculous. The proliferation of online-only tie brands such as Viola Milano is a testament to the very healthy, attainable margins. A fawning i-gentry does help too. Also, and in light of the above, I cannot fathom why a 9-fold grenadine would be priced identically to a 9-fold cashmere. By the way, the ties look great. Hi Simon, Intrigued by the AK/VM ties. Do the folds run the entire length of the ties? Generally as a matter of principal do you accept repairs to things which aren’t actually your fault. I don’t really like the idea of being left with a ‘lemon’ when it’s not my fault. Perhaps in this case it’s ok though, if it’s a minor repair, the thing is the people in the shop don’t know themselves what the factory did or didn’t do! Cheers.